Aren't we reading too much into this? I think he purchased a CPR "Mike", hoping to run it, or turn it around into huge dollars. Those dreams never happened. With regard to staybolts, remember at he time this pronouncements came about, she was in regular freight service, meaning hundreds of trips each month. On a 25 mile run in preservation, does that predict the same issues? Besides, as much as I would love to see her under steam again, operational restoration is not necessary to keep her in preservation. I believe her last assignment was as a snow melter. Why would CPR keep a problematic locomotive when scores of others were on the dead line? Joe, as it was explained to me, it was just this one engine, not the whole class or a lot of the class. Richard, agreed. Just sharing what I had heard regardless of its bearing on the engine's future. Does the owner of the locomotive also own the land it occupies? If not, that's another potential complication or threat to its existence. Al Crisp here; At this point we are not even entertaining an operating scenario ,just get it to safety from the torch. Anyway looking at the location I doubt a scrapper would want to bid with out it being moved to clear location. 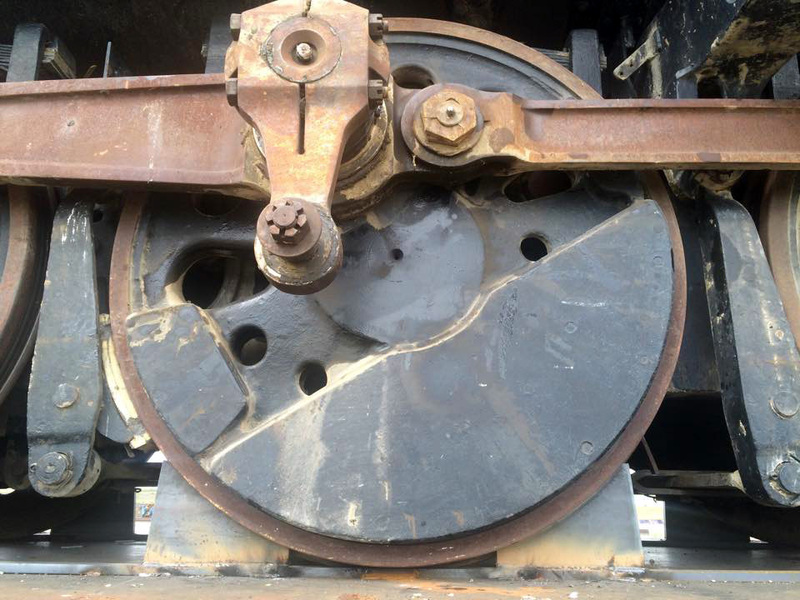 I have more then enough photos of steamers being scraped and it is a labour intensive job, plus you need a crane or a couple front end loaders. Sadly it was the last job that some old steam cranes did was to help pull a part the locos. That being said I would guess he might get 20,000 tops. Thanks for the photos, I had looked at them before but the big thing is the track under all that greenery leading back to the switch beyond the scale and how far does it go??? If none knows for sure I will ask Larry over at the DLW. He seems a friendly sort and showed interest in our attempt to get the thing moved. I will talk to him about how and who does their track work or is it in house and perhaps they could help. Just got a crane and rigging quote OUCH!!!! The most economical option would probably be to wait until the owner passes and then contact the family, offering to match the highest offer. But by then those who are in a position at CPR to help may have moved on, economy could tank, merger, etc. The owner's price is perhaps $30,000 more than scrap value plus the value of all the jewelry (builders plates, headlight, bell, gauges, etc.) sold in the railroadiana marketplace. Taking the ghoul route might save you $30k on acquisition but you'lll end up paying 10 times that on an emergency move. Al Crisp seems to think she's worth a lot less in scrap, given the issues with where she is and what it would take to get her out of there. An extra 30k is a lot of money if you are collecting it $5 and $10 at a time. Especially since this engine is still a horse without a rider. Al here; I a m basing that estimate on round numbers starting with the relative payout for scrap delivered. From that they have to deduct the cost of cranes[about 300 an hour for a week] to boost it out over that bush or move the loco out to clear ground. There is labour to cut it up and trucking to a big scrapper, about 8 to 10 loads at about 600$ per trip. There probably is environmental costs and rules to be aware of too boot. Al Crisp here again. Made contact with the owner and had a great chat and we have been exchanging photos and names of railway folks we know in common. Go figure all these years. He has a couple fellows coming to look at the beast as an operating scenario. I have my doubts on that front unless they have a half dozen million to drop, thinking back to 2816 and what CPR spent[they never did disclose publically]. I would hate no matter what if it gets moved to see it end up in a worse position. After talking to him and what he has put into 5361 in 30 years of looking after it, the asking is not out of line. Terry put 60,000 alone into the asbestos removal. Also spoke to the manager at Buffalo Tungsten ,the land is all theirs and he is cool with whatever happens. The track is all there only needs to be brushed then checked for rot. No matter what happens that track needs to be used and all agree we can work with the DLW. I did talk with Larry the super there last week so that line of contact is open. Is there anyone on this site who has actually been involved in lifting a steamer in it's complete state. I have done everything from soup to nuts but not a steamer. If things come to pass we will be employing professional riggers but I want to be sure. I have seen some dumb things done and damaged by not paying full attention. "s there anyone on this site who has actually been involved in lifting a steamer in its complete state." I recall a fairly good, complete account of how one of the Reading T1s -- a far bigger locomotive than 5361 -- was lifted with jack frames for shipment. Someone here can find it more easily than I can. In fact, if I recall correctly the organization involved kept the frames they used, which are easy to handle with a forklift and quite portable, for any subsequent use. These might be a useful resource when 'the time comes'. Look at the move of CNR 6167, a while back. 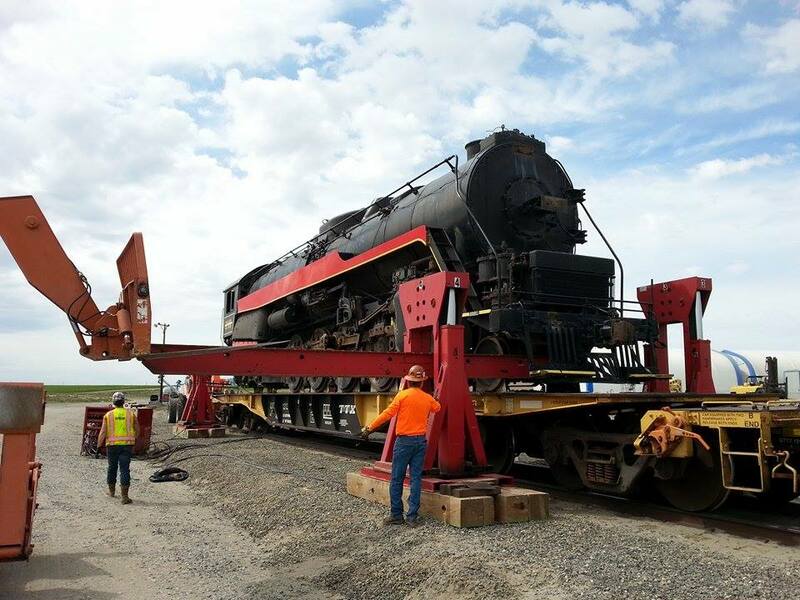 She was lifted by two large hydraulic rams, one with a beam under the cab, the other with a sling around the smokebox, just like she used to be lifted in the old days at Stratford. But that comes with the caveat that her smokebox was in exception shape, after having her stack capped all these years. The biggest issue when jacking is to pull out all the grease cellars and the like from under all the journals, lest they be crushed when the engine is lifted, and of course installing wood blocking underneath to support all the wheels. Of course, this means lots of time spent UNDER the locomotive. I don't know if the firm kept their lifting gear, but here's a photograph of the lift. Removing one of the lifting beams, forklift visible at the left. 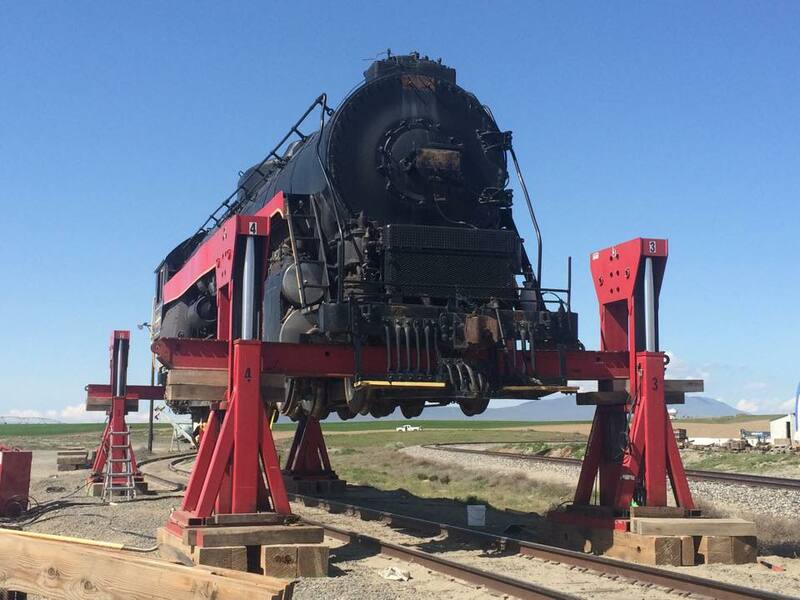 Lifted clear again at her new home--flat car partially visible at right. EDIT: For some reason the page with the updates (gallery) isn't visible directly from the site, even though it looks like it should be. Some more photos in transit here. 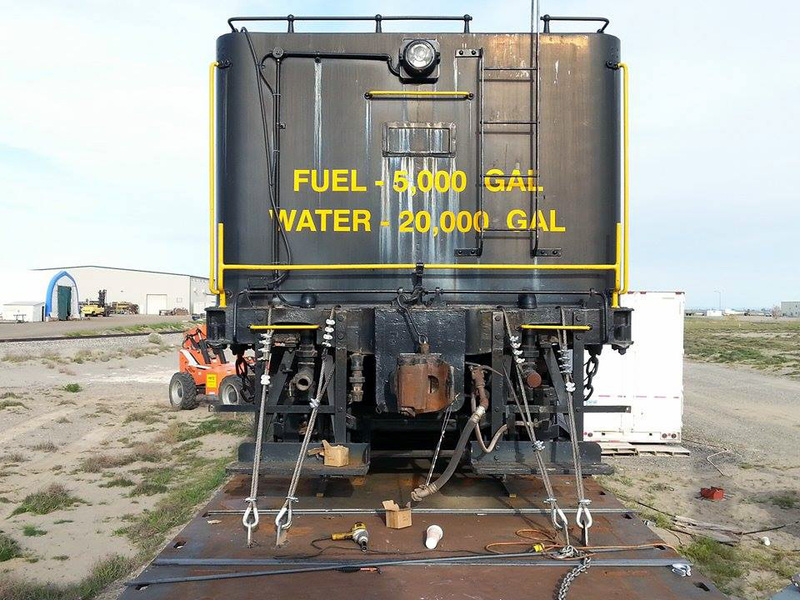 ASR hired Barhardt Crane to both load (Richland, WA) and unload (Cleveland, OH) the 2100 and both tenders. They used their unified hydraulic jacking system. None of the equipment or tooling to do the lifts were particularly specialized. This kind of equipment is used to lift heavy machinery all the time when cranes are not good options. In the technical sense, there is no real "rigging" used here. Rigging is usually the chains, slings or other attachment devices hung off the hook of a crane. In many regions and locale's, the crane owers/operators do not provide the rigging and you may have to engage a separate entity for that. Every crane outfit is different but particularly in cities with a strong union presence, you may find the need to hire separate riggers. Do your research and always get multiple comparative quotes, especially if its work you do not normally hire as you may not have a familiarity with what a particular service really ought to cost. My general rule of thumb is to get at least 3 competitive quotes whenever possible. Barnhardt has locations all across the country which was one of the chief reasons we decided to go with them. And here I thought it was a Jedi mind trick! Guys I'd caution all to be careful with the guesstimates of what it will cost to restore this machine to service. 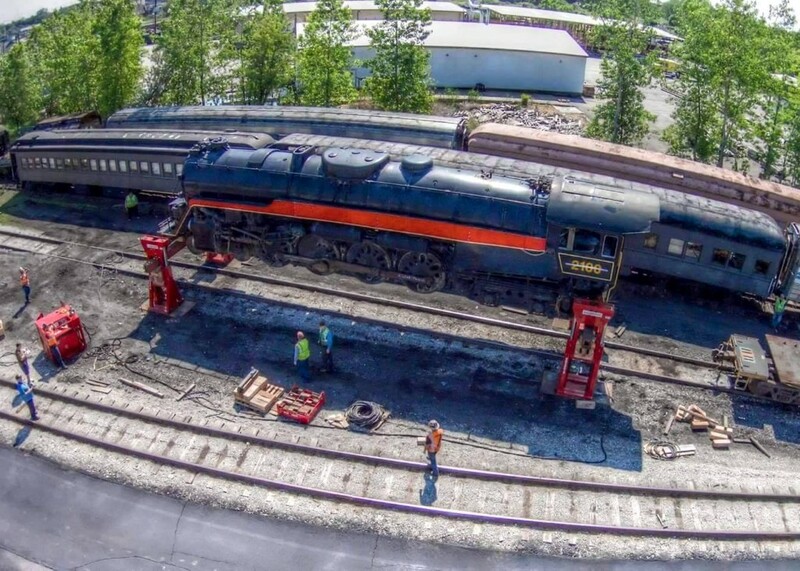 I can report with accuracy that we spent $ 1,345,700.00 1980 dollars restoring C&O 614 in Hagerstown Md. ( approx. $ 3,000,000.00 2018 dollars) which included substantial upgrades to her main tender, building an A tank with steam heated, pressurized oil room and some work on the shop/tool car. The recent return to service of the N&W 611 cost approx. $ 2,000,000.00 (current dollars) and she was put away in 1994 by Scott Lindsay with everything possible done anticipating a return to service. 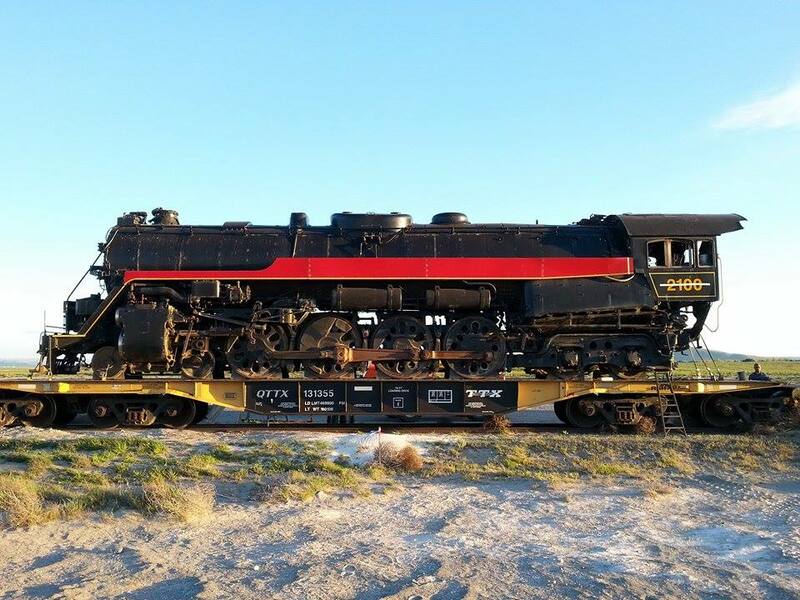 No one knows what it will cost to return this locomotive to service until she's taken down, given the complete FRA Form 4 inspection and then a reasonably accurate estimate can be constructed. I can tell you from experience that it will end up costing somewhere between $ 1,500,000.00 on the very low side and $ 4,000,000.00 on the high side. Should the ultra sound examination discover the need for a new firebox and/or boiler then you can add $ 2,000,000.00 to the high number. So, when your talking money you need to at least be in the ballpark with your numbers. Al Crisp here; Thanks for the photos using the hydraulics. They work great if you are in absolute straight up and down situation and are on solid, flat ground.They are designed to work were a crane can not go, and lift a heavy machine off a truck and place it exactly with no side to side movement. I do feel a little uneasy about the high center of gravity during the lift. The dynamics are totally different with two cranes.The way I have been approaching this if it only go a couple hundred miles, is the loco by rail car the tender on a truck trailer. If I understand correctly that dead in tow is out of the question these days given the fact it is all friction bearings on 5361. Maybe someone knows for sure as this in odd thing no one I talk to seems to know. The owner says all the brakes still function.